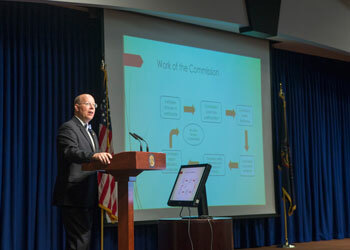 HARRISBURG – In an effort to bridge the gap between conflicting House and Senate proposals addressing past cases of child sexual abuse, Rep. Paul Schemel (R-Franklin) today at a Capitol news conference unveiled his proposal for a comprehensive solution which avoids costly and time-consuming litigation. Schemel has introduced legislation that would create a “Truth and Restoration Commission” to hear testimony from victims as well as the institutions responsible for past abuse. Victims with credible claims would also receive compensation from a special fund created by contributions from the institutions which concealed abusers. To view Schemel’s video comments, visit here. The state commission would have seven members, appointed by the governor, House and Senate, and include an attorney, an accountant and a psychologist. Compensation payments would be based on a formula that would take into account the nature and extent of the abuse, in addition to any prior settlements and total number of victims. The commission would have a defined tenure of 10 years. A video of the entire news conference is available for viewing at RepSchemel.com . Links to broadcast-quality Sot and B-roll.